PRESS RELEASE: JZ Microphones launches the ultimate drum microphone kit - JZ DMK1. A general purpose of the JZ DMK1 is to use the mics for drum overheads and the kick drum both live and in the recording studio environment. JZ drum mic kit consists of three JZ BT201 small diaphragm condenser microphones: a matched pair with open cardioid capsules for overheads and a single mic with - 20dB open cardioid capsule for kick drum. 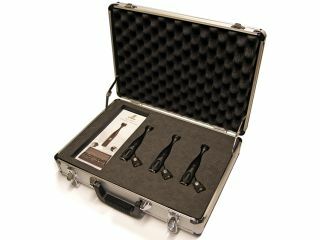 The kit also includes JZ mic clips for all three mics and everything comes in a rigid carrying case so it is easy and safe to take the kit with you wherever you are going to record. JZ DMK1 is shipping now and available at JZ Microphones online store for a special introducing price 1000 USD until 5 December 2010.